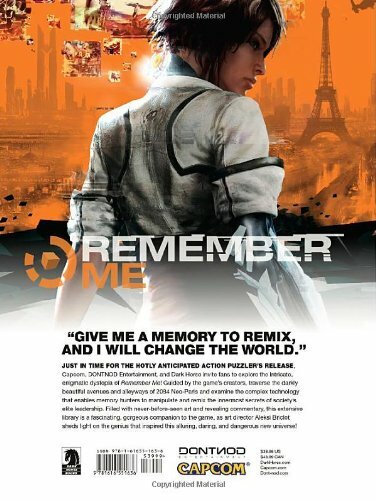 Capcom and DONTNOD Entertainment have created quite a surreal dystopian world in the game Remember Me. That world comes in the form of 2084 Neo-Paris. Parts of the city are now populated with cool sleek skyscrapers. Elsewhere, the city feels more gritty and weary. The art direction for the game is wonderful. The sci-fi elements are nicely laid over a city that still retain the beautiful architecture. It's still Paris, it just looks and feels so different. The art book is 184 pages, hardcover. Publisher Dark Horse has used thick low gloss paper. The reproduction quality is terrific. About half of the book is filled with amazing environment art of the Neo-Paris. They explore the alleyways, streets, slums and interiors. The designs looks great, believable and moody. Many of these are painted to the level of detail that you typically get from photographs. It's astonishing. Every illustration wants you to spend time to study, to absorb what you've just seen. Most are printed at half page. Every one that's printed small will have you wishing it to be bigger. The other half is packed with character designs. Mainly humans. There are only a handful of sketches, the rest are all painted in detail. There's a good amount of writeup for every page with the exception when the art goes two pages. I've to list out the artists for their incredible work. They are Aleksi Briclot, Michel Koch, Frederic Augis, Gary Jamroz-Palma, Gregory Z. Szucs, Paul Chadeisson, Edouard Caplain, Alexis Smadja-Fellous, Bastien Ramisse, Regis Capotosto, Yan Le Gall and Cristian Buliarca. This is an excellent video game art book. And this is the first game for DONTNOD Entertainment. More please. Highly recommended to anyone who likes art. Easily one of the best art books for 2013.
looks very cool. I think I might need to get it. I'm really running out of space to put all my artbooks. I'm also waiting for the new Superman movie book, and the Korra book.